Did Ionut Alex Chitu leak Matt Cutts' email address? Sadly this is a true story and not something I’ve made up for Halloween. I was emailed today by someone offering to sell me Matt Cutts' email address. The emailer told me that a popular but unofficial Google blog had accidentally leaked it. I had to decide by 5pm today (no time zone was specified) whether I would pay $5,000 for the address or the person behind the email would offer the address to my competitors for $7,000. Oh dear. Firstly, I’m based in the UK so I prefer to deal in Pounds Sterling rather than Dollars – although with the current rate of exchange the Dollar is pretty cheap for me to buy so maybe the $5,000 would have been a better deal. However, if this ‘canny’ emailer had done his research and worked out who my competitors are I would have assumed they would have noticed although I work for a global digital agency but am clearly based in the UK. 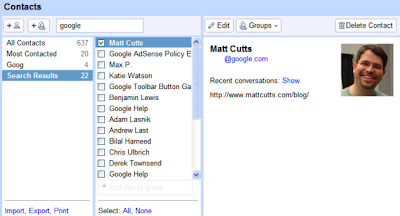 Has it happens Google Operating System did publish a screen grab which included Matts’ email address. Briefly. Philipp Lenssen noticed and kindly pointed out the little slip up. It's an easy mistake to make and it was corrected. Here’s the newly censored image as it appears right now. Needless to say I didn’t pay the $5,000 charge. I wrote back and told the author to grow up. Based on the quality of the email I wouldn’t be surprised if the author was actually only 13. I imagine a fair few people saw the address. Listen folks – if you don’t know Matt then don’t email the address. If you do so and expect good things to happen then you’ll be disappointed. The man is hugely busy. You can tell that just by reading his blog! It doesn’t take a genius to guess at the email addresses used by Googlers either. I just recommend that you don’t guess and don’t make a nuisance out of yourself by trying to pester these people with unsolicited emails. The best way to email Google is to use one of the group aliases and get a ticket number (keep it in the subject line of the email at all times). That way you know your email will get through the system and someone will look at it. I email members of our Google account team directly. I email Googlers who I know well (have been to the pub with) directly. All my other Google emails go through the same channels as everyone else. Just because I’ve bumped into a Googler at SES or SMX does not, I feel, give me permission to start emailing them directly. As for trying to hawk the email address of Googlers – especially with a “pay up now or I’ll raise the price’ deadline – grow up, idiot. Got to be your best post yet, Andrew :). In all seriousness though, think your response was spot on. If the 'vendor' had any serious intelligence at all, he would have done a little bit of homework, and probably worked out that perhaps BigMouth werent the best choice.